Save time and money, while easily having your office do your property inspections for you. to save time and money. Now its your turn. Managing employees— What did they do for the day? – Where have they been? What time was the property inspection finished? – How long did it take them? – Are they doing a good job with the inspections? Wondering what inspections are due next and what is past due? Wondering where these properties are at and the best order to do them in? If your employee calls in sick, do they still have the clipboard with inspections, and all the photos on the camera? Then they need to manage all the photos on your computer, deciding which property pics belong to what house, naming photos, etc. See property inspections completed, scheduled, & which inspector is completing. 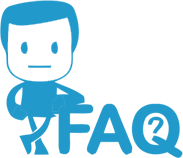 It is a mobile app that works with your mobile devices so that you are able to do property inspections easier and faster. 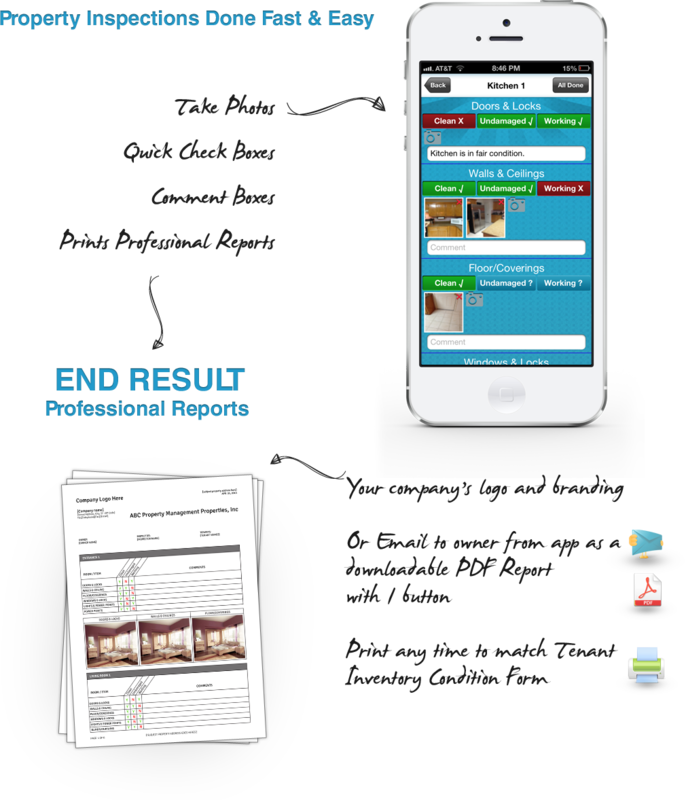 Using check boxes, texts, and photos Inspect & Cloud allows property managers to do property inspections easier and faster, with less room for errors. What if I lose my phone or tablet—do I lose my work? No. Once a property inspection is complete you just hit the send button and it pushes the property inspection to your inspection property cloud. No information is actually stored on your phone. 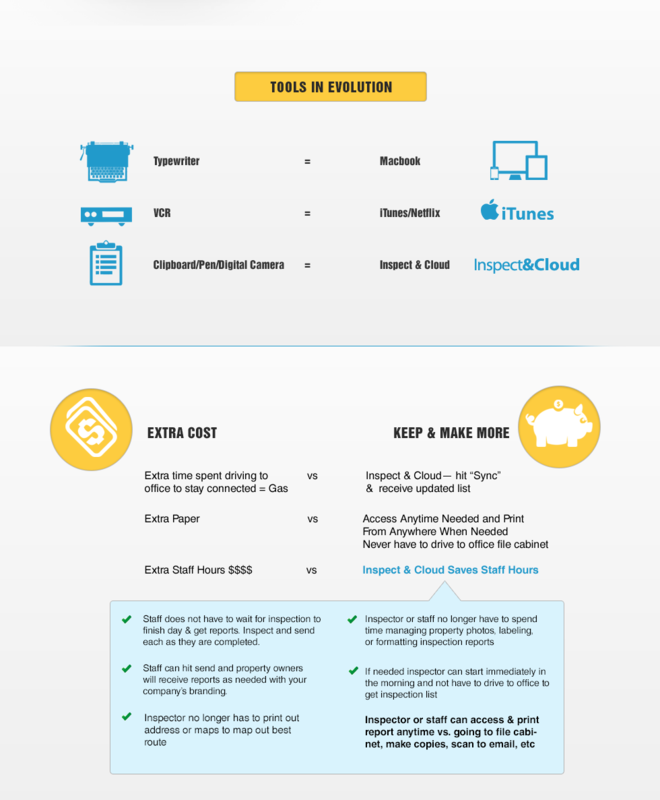 You can begin using Inspect & Cloud and be set up within 15 minutes. Simply request to sign up and we will email you a user login. From there we will email you instructions as well as a report to assist you and your staff. We are certain that once you see how it will make your life easier in property management you will understand how quickly you can increase your profitability and focus on growing your business. Currently, most of our brokers are having their employees use their own iPhones to do the inspections. Since your inspections are stored on your web login, you control their ability to login and what they can inspect. In the rare case that an employee does not have a smartphone, many of our brokers will simply purchase a iPod touch for the office at $199 that has an HD camera. 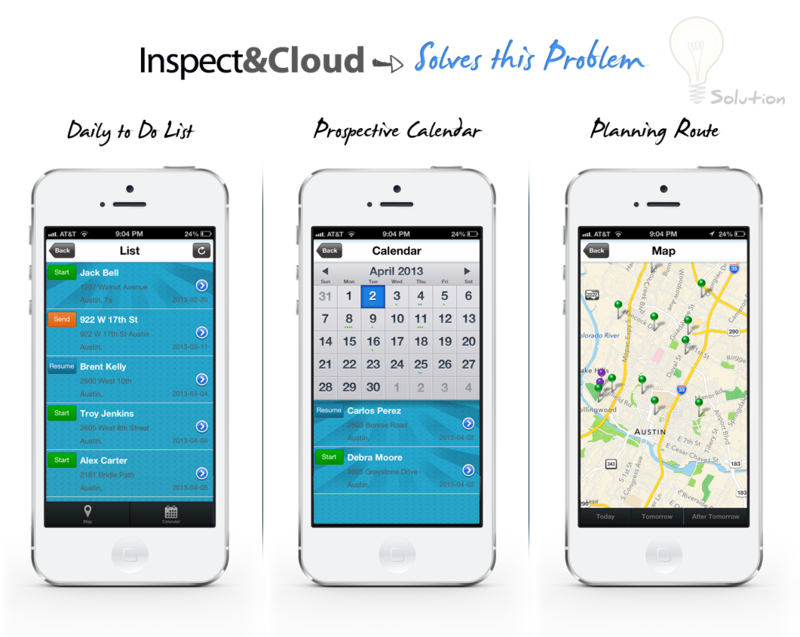 Inspect & Cloud works with the iPod touch so that you can use this tool to do their inspections vs most office digital cameras alone which are in the range of $300-400 dollars. Companies find it more beneficial to use one device that conducts the entire property inspection and to speed everything up automating the property inspection process.